31 January 2018 Ashley S. Miller Specialist of Customer Service Dept. 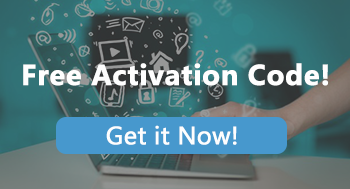 Directly copy everything from your original hard drive with the best free hard drive cloning software - Renee Becca to a new one. Quick and reliable. Hard drive cloning software means copy everything from one computer’s hard drive to another new hard drive. Generally, the content of the first disk will be written to an image files as an intermediate step. 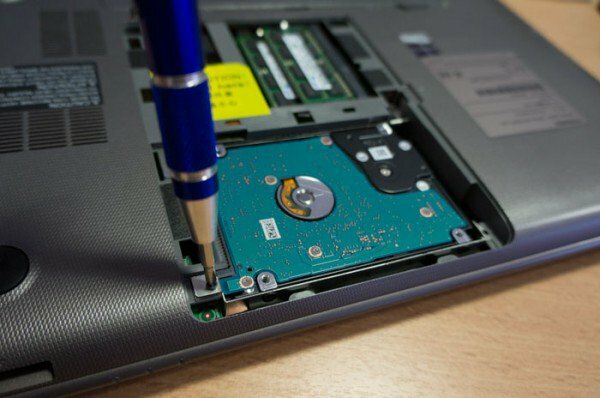 This process may take a whole day because we need to make an image files for the original hard drive and then restore the image to the target hard drive. However, with professional disk clone software – Renee Becca, you can achieve the cloning process directly without creating intermediate. Move to a larger capacity HDD and do not want to reinstall system. Replace the old hard drive to a new one. Defend any possible software or hardware failure problems. Make backup for the current hard disk. Just a few simple clicks and Renee Becca will finish the rest process for you. Reliable and fast. Equipped with easy-to-understand wizard and interface, Renee Becca is a helpful software for both professionals and computer novices. Besides, minimize the chance of data lost or disk crash. Preparation: Only full version of Renee Becca can make the target disk bootable after clone. If you do not activate Renee Becca, cloned disk can not boot the target computer normally. Step 1: Launch Renee Becca. Connect target disk to computer. 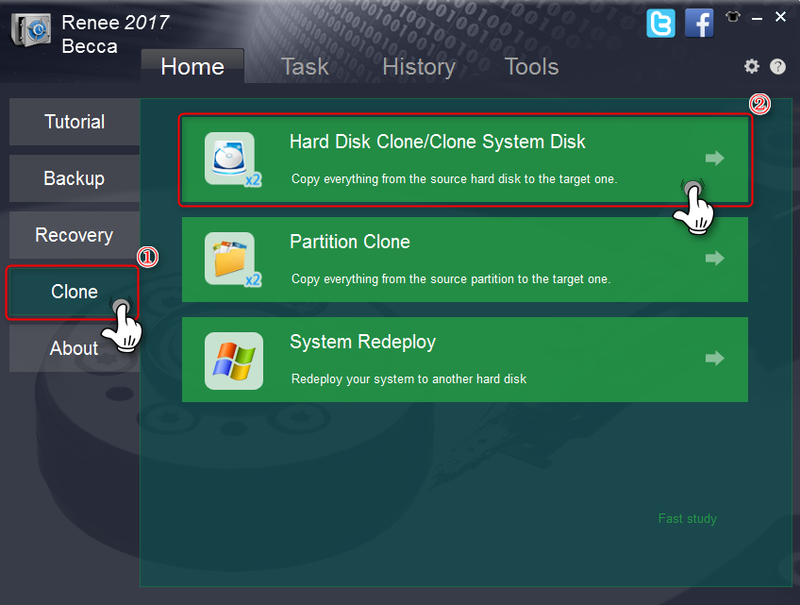 Go to “Clone” function and click “Hard Disk Clone/Clone System Disk”. 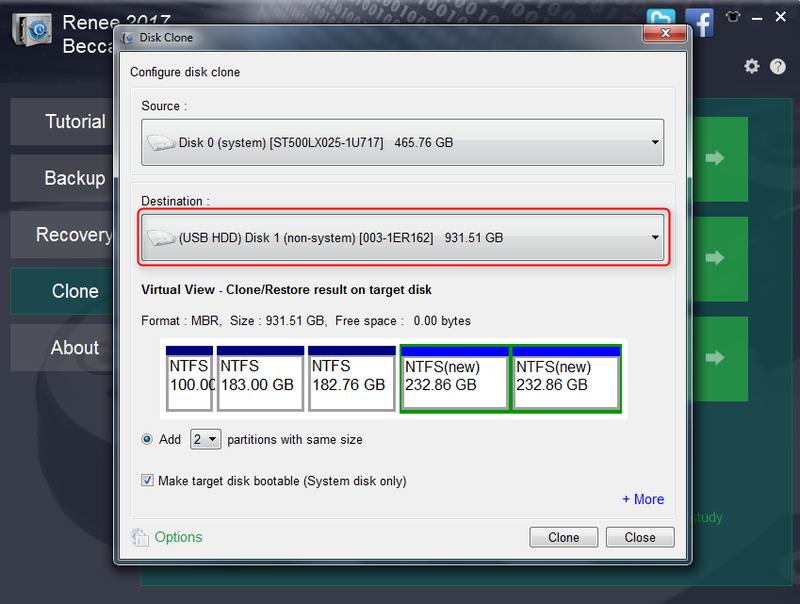 Step 2: Select the source HDD and the target disk. Renee Becca will identify the original disk of your computer automatically. And connected external disk will be marked by symbol like “USB HDD”. Please check the item of “Make the target disk bootable (System disk only)” if the disk you clone for contains system. 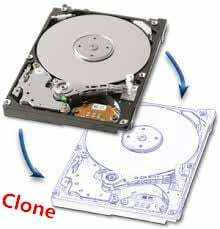 Cloned disk should be used in the same computer which the original disk is in. Step 3：You can check or compare the partitions size of different plans in Virtual View. After selecting the target plan, please click “Clone” to process the clone. It is very common for users to replace the HDD with a larger one. 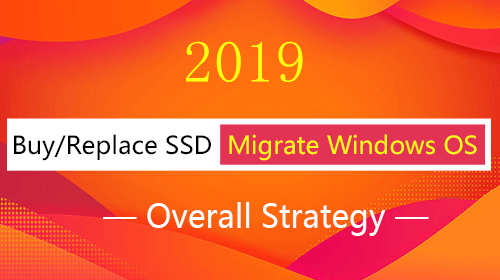 With Renee Becca, you can make full use of the free space with the following 3 plans when cloning disk to another with larger size: add partition(s) with same size, extend original partitions size and keep original size. What is the difference between 3 different plans? Here we will make example for you. Free space will be divided into the new partition(s) you select to add in Renee Becca equally. All space of new disk will be allocated according to the scale of the partitions’ size in original disk. Clone the original partitions to new disk with the original size. Leave the free space to be unallocated. You can allocate the free space with Renee Becca after clone. Step 4: Boot the computer with the new disk after clone. Take off the original disk, connect the new one and boot from the new disk directly. * Please make sure the computer can boot from the new disk normally before formatting the original disk. Want to clone disk without going through system and software resinstallation process? Then you can find perfect solution here! 100% free hard drive cloning software helps you make the disk clone with 4 simple steps! Bootable after clone finished!